Out of My League is a compelling story of letting go of the past in order to grow into the future. At its center is a couple, two worlds apart, who find themselves facing decisions that challenge their independence, their commitments, and their way of life. Neither knew that a single trip to the library packed the potential to change them both forever. Consumed by ambition, J.P. Ralston has control over everything in his reach. A successful law practice, any woman he desires, and total social freedom. A sudden turn of events has J.P. scrambling for parental rights as he is forced to come to terms with remnants of past mistakes. In the midst of the chaos, one woman threatens to strip the jurisdiction hes come to know as his own life. Samira Cartwright is a young widow, raising her daughters, completely content in the world shes created for herself. Safe from relationships and social agendas, Samiras days are immersed in family affairs and managing the business of the Maple Street Library. One visitor awakens her spirit in ways shed banished from memory. Samira suddenly finds herself longing for companionship and dreaming of the man who dared to make her whole again. 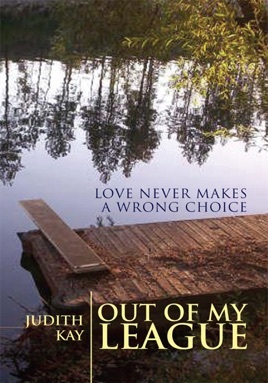 Out of My League is so real readers will find their own lives etched in the pages. Love never makes a wrong choice. Yet surrendering what has always been to seek what might yet be is the challenge of a lifetime.